Whether you’re a local couple or looking for the ultimate destination wedding, Maine certainly is a beautiful place to tie the knot. From dramatic rocky coastlines dotted with lobster buoys to the fall foliage of the western mountains, there are tons of incredible wedding locations to choose from in Maine to make your big day perfect in every way. For those looking for the ultimate intimate and rustic Maine wedding destination, the Barn on Walnut Hill is the perfect venue. The 19th-century barn and farmhouse have been restored to their former glory and the gardens and lawns are perfectly manicured for wedding portraits. The venue is only available seasonally from May through October and can accommodate up to 200 guests. With stunning ocean views and beautifully maintained gardens, the Inn by the Sea is the perfect venue in Southern Maine for your seaside wedding. With a variety of event venues, the Inn can accommodate small intimate weddings of a few people or large social events up to 150 guests. You’ll certainly love all your wedding photos from this beautiful venue. This former 1856-era church turned restaurant is an incredible backdrop for a unique wedding. From its colorful stained glass windows to its unique architecture, Grace is a cool place to hold your wedding reception. The space is large and hold parties of varying sizes and as an award-winning restaurant, you know the food will be delicious. If the ocean and salty air is not your style then maybe the freshwater and pine trees are just want you want in your magical Maine wedding. Migis Lodge built on the shores of Sebago Lake is an incredible location for a real Maine wedding. You can arrive in the Lodge’s classic 1947 Chris Craft and exchange vows under the gorgeous pines with the western mountains in the background. Guest have exclusive access to the whole property and the food menu is customizable to your desires. Many Maine brides dream of getting married overlooking Frenchman Bay in the charming coastal town of Bar Harbor. With tons of incredible options, the Bar Harbor Inn is the ultimate choice. 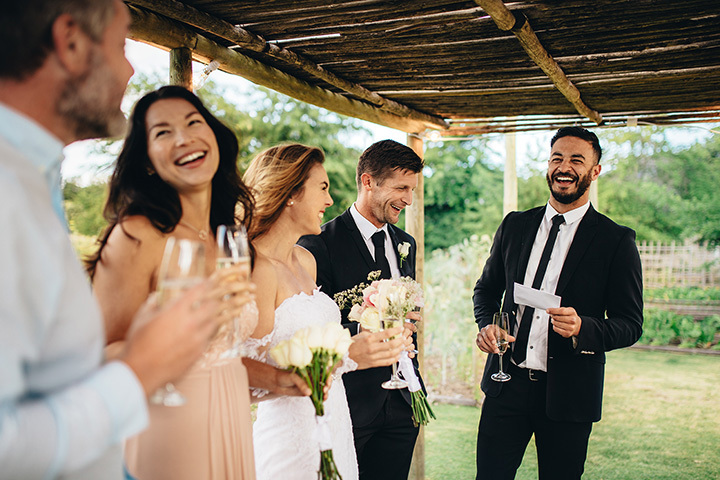 With three different venue options, you’ll find the perfect place your both your ceremony and reception. The Bayview Lawn is perfect for Oceanside ceremonies in front of the white arbor while the 1887-era Reading Room is an excellent place to hold your reception. Set on a dramatic peninsula overlooking Penobscot Bay, French’s Point is the ultimate destination for couples looking for a seaworthy wedding. The grounds are beautifully landscaped and the venue is unforgettable. There is a mission-style ballroom inside the Estate House or you can choose an outdoor wedding and reception with sweeping 280-degree views of the Atlantic Ocean. Open year-round, the Samoset Resort is an exceptional venue to host a wedding. The resort is nestled on 230 acres overlooking Penobscot Bay in Rockport and has multiple venues on the property to host an array of wedding sizes. The resort offers a variety of customizable wedding packages from romantic winter weddings to charming intimate summer affairs. For the perfect fall wedding, you’ll want to head to the western mountains of Maine. The historic Bethel Inn Resort is an incredible classy resort to host a wedding of any size. Wedding packages are customizable and affordable. Not to mention, your guests will want to spend the weekend here just enjoying the great resort and charming town. Recently names as one of the top 30 wedding barns in America by Country Living, Hardy Farm in Fryeburg is a picturesque location for a Maine wedding. Established in 1750 in the White Mountains of Maine, the barn was renovated in 2013 to host an array of weddings throughout the year. Open year-round, there are plenty of incredible ways to host your perfect Maine wedding.